Sorry for the delay in blog updates. These young ladies have been keeping us running around with all their creativity. The robotics class working to clean the ocean has been working on their final projects. So far they’ve torn apart various toys and electronics and repurposed the parts to make a small boat that should move around collecting trash. It’s interesting to see their various ideas on what would be best. The LEGO class has made good progress in their various projects. The ladies have different objectives. One is to create a “puppy dog”. 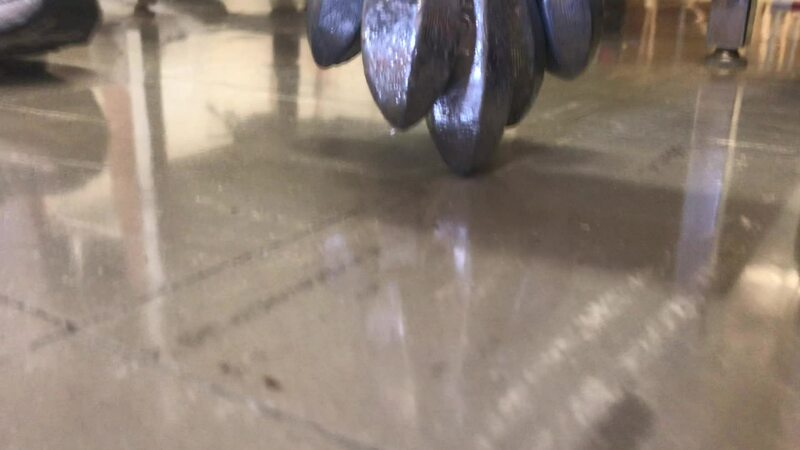 This is where the robot comes to you, then stays about 6 inches away. If you move away, it follows, if you move toward it, it backs up. 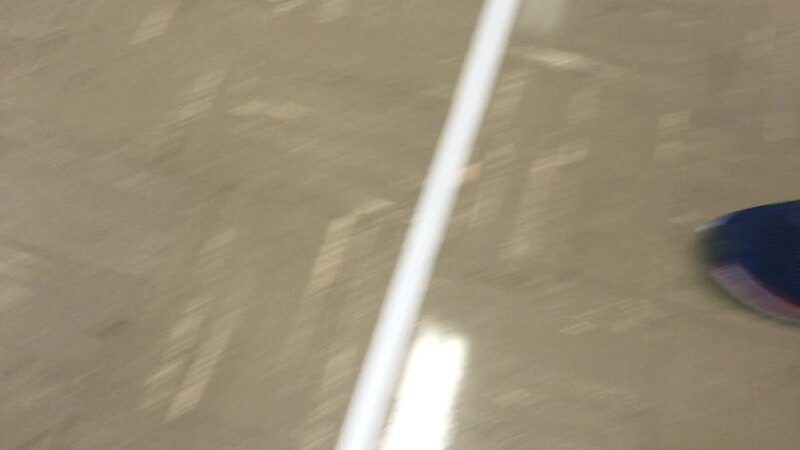 Another objective is the school zone where the robot moves at a high speed and then slows when it detects a black line on the floor. It resumes full speed when it detects the other black line signaling the end of the school zone. The third objective was to have it stay within an enclosed (semi enclosed) area. When the sensor detects black it spins around and goes a different direct. The video shows more (along these lines). In the Refrigerator Science class, our young ladies learned about the effect of vinegar on an egg. They had to name it and draw a face on it, which seemed cruel since they were about to destroy it. The eggs went into a small cup and then in went the vinegar. It started bubbling slightly, but the real effect takes place after 24 hours. There will be updates tomorrow. In Bridge Explosion, there were some interesting ideas. Each team had a different perspective on what would be the strongest bridge design. There were some that looked really strong, but who knows what Friday will bring. Finally, in Geology class, the ladies were making their own fossil crystals, searching for micro fossils in some dirt, and putting together a model dinosaur. Friday, these ladies will go to the Caribou Nylander Museum to see some real fossils and many other interesting things. We completed the last check in for the 2018 MSSM Summer Camp yesterday and we have started Girls’ Week Two. Camp check in, and check out, takes place in the gym. Campers come in and get their name tag and family color, then they are given a camp t-shirt and told Monday is Camp Pride day where we take a group photo after lunch. Then they move along the other tables and turn in any forms or money due and talk to the camp nurse about meds/allergies and the director of the dining hall about any dietary needs. We can handle any special needs such as gluten free, vegetarian, no food colorings, etc. The campers just have to speak up and let the staff know they have a request. One of the stations they visit is where they get their classes for the week. We have to wait until the last minute since people make changes online and we can’t assign them any sooner. If there is a problem we can change their schedule to make them happy. At this table, campers can also buy some of our merchandise. We have stadium cups, stress penguins, and hoodies. The hoodies have a special bonus attached to them. If you take a photo of the camper wearing the hoodie between October and April and tag us and write something like, “Can’t wait to get back to the MSSM Summer Camp”, you are entered into a contest where you could win a half-off gift certificate to camp in 2019. Plus, we also have the Refer-a-Friend campaign where returning campers get $100 off when they recruit new campers. We will have more details on the site in the fall. If you want to be here, money should not be a factor. 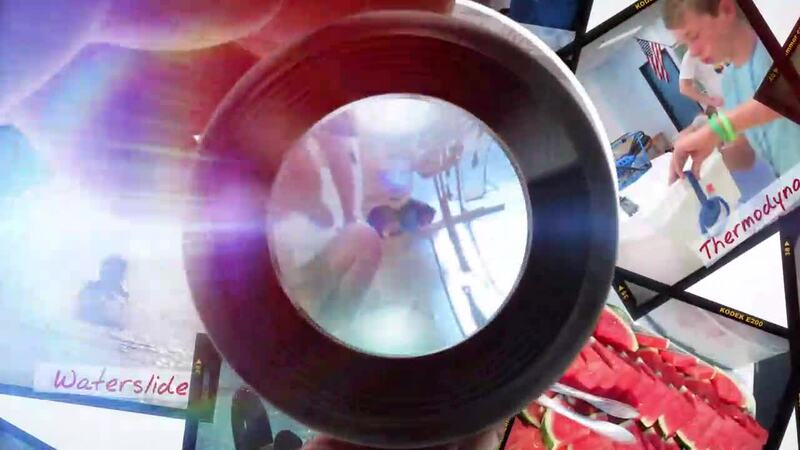 If we can save money on advertising, we can use that to buy more cool stuff like huge chess sets, drones, massive water slides, more 3D printers. 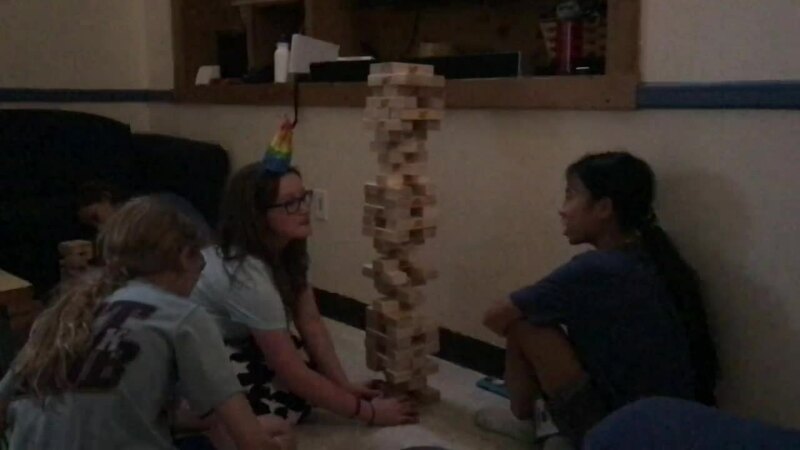 After check in, campers chill out in their rooms or go into the lower lounge to meet other campers and play board games or other activities. At 4 PM they meet in their family lounges and go over the plan for the week and rules of camp. At 5:20 we have dinner which is usually in the dining hall, but on Sundays (weather permitting) we have an outdoor BBQ and then do introductions. After the administrative team talks for a minute, the teenage staff does an intro skit and then campers go back to their lounges to make their family flag and make their own intro skit. We don’t expect much since they have an hour and 45 minutes to think of a design for the flag, think of a skit idea, create the flag, and write/create/agree on/practice/memorize the skit. We are often pleasantly surprised as we were tonight with the Purple Family. They had a great, and yet simple, skit that both expressed their names and said something about each one. It was so effective, it caused some staff members to come out of their houses (behind the skit area) and come see what was going on. The girls clapped and then made a little rhyming song with their name and hobby. One example was “Shibuya yea yea Shibuya Roll Call” my name is Sana, “yea!” I come from Japan, “Yea!”, I don’t have cats, “Yea!”, but I breakdance. Then the next girl said hers. So in the course of about 30 seconds, Sana, who is from Japan (and came all that way just for the camp), can actually breakdance. So she told us three things about her that were true and it was easy to remember. They won the skit contest and were rewarded with more s'mores. The video shows a clip of their skit. After that, everyone was exhausted and it was approaching 9 PM. Then Mr. Berz came out and sang the new MSSM Summer Camp song. The ultimate goal is to have him sing the first two verses, then have the campers make up their own family verse, but this year we didn’t have time to build that into the plan so all we did was have him sing it. We will make time in the future. We have a busy week and it’s our last week so we are giving it all we have to make sure these young ladies have a great time and are inspired by STEM and go on to find a cure for cancer or step foot on Mars or invent that new piece of tech that changes the world. So much for thunderstorms this week. It has been warm here in beautiful Limestone, Maine. We had the waterslide today instead of tomorrow due to a scheduling conflict with the Limestone Fire Department. That worked out well since it was hot all day even with occasional clouds. Everyone loved it and they were all able to go down it about 20 times each. It’s so large they can go down in groups and not collide much. At that age collisions are no issue. One Tuesday afternoon activity was rock climbing at the University of Maine Presque Isle gentile Hall rock Climbing Wall. We took 10 ladies and they each shot up the wall and almost all touched the top. I told them if they beat their personal goal on the wall we would all get ice cream on the way back. They did and we enjoyed the cool Houlton Farms twists. In the Robotics Raceway class, campers tore apart old toys and repurposed the motors. They are starting to build their robot boat that will clean trash automatically from a small pool. Maybe this will encourage them to keep the passion about cleaning up the earth. One day, one of these young ladies will build the first machine that is set out on its own in the Pacific Ocean and starts cleaning. In We See 3D, the ladies made some creations on the computer while others printed out finished models. Camper Hailey is creating a Tottoro set while another camper is making some creature. In one photo, you can see Camper Sophie wearing her horns from Creating Brave New Worlds, a class that finished last week. Geology started their seismographs and did some tests. It was interesting listening to them talk about ways to make it more accurate. Other groups focused on making their more attractive. One group is making a seismograph in the shape of Nyan Cat (a popular meme). In the Bridge Explosion class, the ladies started testing their designs. They drew out their plans on Monday and Tuesday and then have been starting the builds today. There has already been some testing of bridges, but there is more work to be done before the final test on Friday. The evening activity tonight is a movie in the gym, so no photos. Tomorrow is the infamous Monster Night with challenges at every station. The girls are having fun and we are glad they are here. I’m sure one of these young ladies will cure cancer or be the first on Mars or reinvent the wheel or discover there actually is a last digit in PI. All the young ladies got checked in Sunday, then went to their families and learned some camp rules and procedures. After dinner the staff did introductions and then the campers went back to their lounges and created their own introduction skits and then family flags. Don’t worry, we don’t expect oscar award winning performances from an hour prep time. Then they perform their bits and present their flag. Ideally, it’s by the campfire and they make smores after presenting, but it looked like rain so we did it in the auditorium. Being the first day of class, the Minecraft Welcome to Mars class had to actually build their rockets and blast them off. From here on out, they will be living on Mars and building a new society from the ground up. In Mr. Berz’s Astronomy Tour class, campers learned how to find various planets and constellations using on their hands and arms as locators. 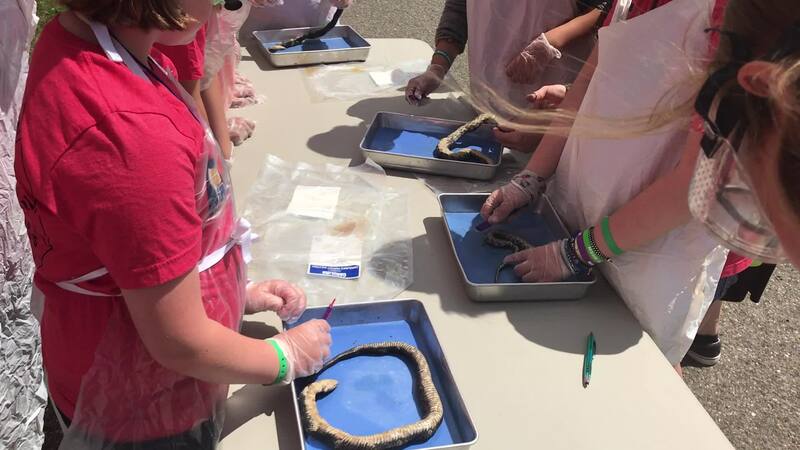 Girls who signed up for the Reptile Dissection class realized exactly what that meant. It is interesting that more girls are in this class than in the boys’ weeks. Not only do campers get to learn all about snakes and other reptiles, there is also a reptile show at the end of the week where they learn a lot about different types and get to touch live snakes, turtles, and various other things. It was super popular with the boys and we are eager to see how the young ladies react. Some of the afternoon events were the always popular NERF Wars, swimming (in one of five Olympic sized indoor pools in Maine), Trivial Pursuit/Monopoly/Uno/etc, JENGA, Chess, Gimp Bracelets, or just reading or drawing. There is also a Baking Activity, where kids make brownies and other sweets. The Monday night activity was “MSSM Mayhem”. This is a variety of challenges that require them to think about strategy while having fun. A few examples are 1) Shipwreck - kids get two pieces of cardboard and have to find a way to get as many group members from point A to point B (about 20 feet). 2) Basketball shootout - they simply have to put the regularly sized ball in the basket. 3) Oversized basketball - same concept, but with a larger ball. They merely have to get it to stay on the rim and not fall. The secret is not shooting it like a basketball, but throwing it more upward and gently. Another popularly challenging one is where they have to remember a pattern (on a large chess board) by stepping through certain squares. They can help each other as a family, but have to step through one by one. Tuesday brings a field trip to University of Maine Presque Isle and their rock climbing wall as well as song-in-a-bag as the evening event. This is an ice cream party event for the winners. We give them 6 items in a bag and they have to make a song about anything that includes the 6 items. 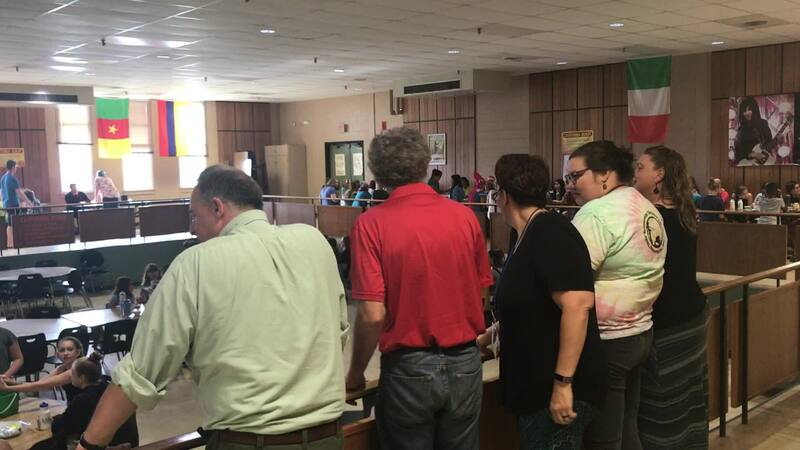 We usually get some interesting ones for having such short prep time and a large group with several opinions. The field trip to the Francis Malcolm Science Center went well, mostly. We had some logistical issues on our end with the bus, but everyone made it and made it back and had a great time. In the Rubik’s Cube class, the kids finished their week long project. In the 3rd period class we saw the Cat Taco or Taco Cat (neither of which makes sense), Shrek, and a group shot around the Flash. 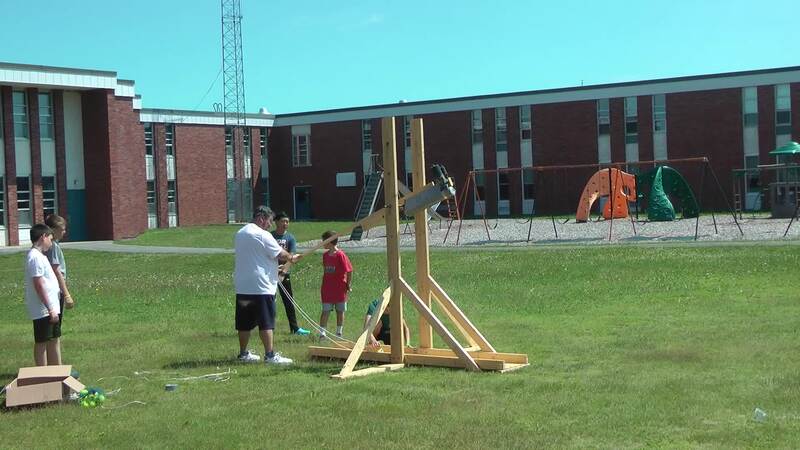 The trebuchet class shot off a number of potatoes (it is Northern Maine), golf balls, and ping pong balls. 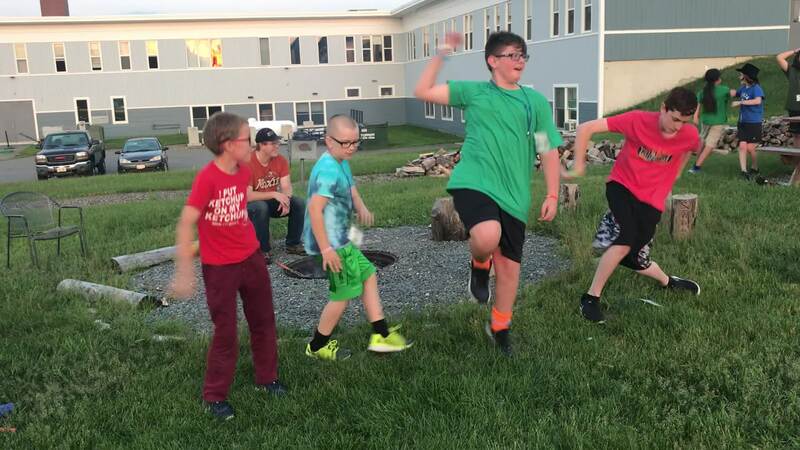 What’s in the Sky campers made air powered rockets and they went much higher than expected. In the We See 3D class, some interesting ideas were created. I remember my childhood where I would doodle a monster and that was as far as it went. 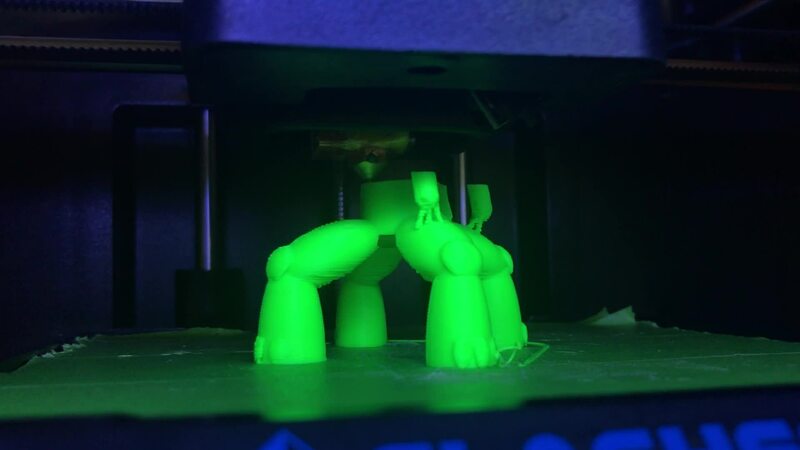 Now a days, kids doodle something and then 3D print it and suddenly it’s real. Amazing. WAGM TV came by and interview me, Mr. David Pearson (MSSM’s Executive Director), and three kids from The County. One is a Mentor (a paid position for ex-campers) and has worked for us for 2 years. The interview should air some time Friday (today unless you are reading this after Friday, July 20th). Thursday night was adventurous. After dinner some of the kids went downtown to buy some snacks and then after that we had the always popular Monster Night. The concept has become a bit loose and should possibly be changed to “Challenge Night” since many people participate, but not many dress up as a monster. Mr. Beckwith always brings his A-Game and this year he also brought a hand puppet that looks like Audrey 2 from the Little Shop of Horrors. I was the “Survey Monster” and asked them what they liked and didn’t like about camp, what kind of class they would like next year, and finally if they knew the answer to life, the universe, and everything else. Only a few kids got it. Do you? We are constantly thinking of how to make the camp better and the “Survey Monster” got some good info. Of course, it was a reward-based activity and many campers just wrote “none, great, yes, what” etc. We are considering changing the length and number of classes each day. In the past, it was 3 classes that were 90 minutes and the past two years it has been 4 classes that were either 70 or 65 minutes. Some instructors have said they preferred fewer longer classes, so we are thinking about that. Some kids have said they want less even structure and more free time for board game tournaments or just down time, so we are working on that too. We don’t want a free-for-all camp, nor do we want a minute by minute structured camp. Friday morning we had classes as usual and then we had the shortened version of the Celebration of Learning at 3 PM. In the past it was kids on stage talking about what they did all week, but now it’s a 15 minute video summary. With 22 classes and each group speaking for 5 minutes about nearly the same thing, it made for a long presentation in the past. Now it’s an action-packed 15 minutes. Follow us on: Facebook, Instagram, and Twitter for more updates.